We’ve developed our most inclusive family leave policy yet and we’re pretty sure it is leading the way for the workplace of the future. We want to support all parents in taking an active role in raising their families, and enable women to return to work after maternity leave. We’ve always offered the same enhanced pay to new parents through our maternity and shared parental leave (SPL) policies. However, when we reflected on how our policies were used, we recognised that they weren’t encouraging new dads/partners to spend time with their new family members. As a fairly young company, with an average age of 33, it is only recently that our enhanced parental policies have started to get any real use. The requests coming through were generally from new dads, who wanted to take time off at the end of their partner’s maternity leave in order to support their partner back to work and have their own bonding time with their child. Under our standard SPL policy, that time off would have been unpaid as it fell outside of the pay period, which followed the statutory pay timeframes of the first 39 weeks after birth. 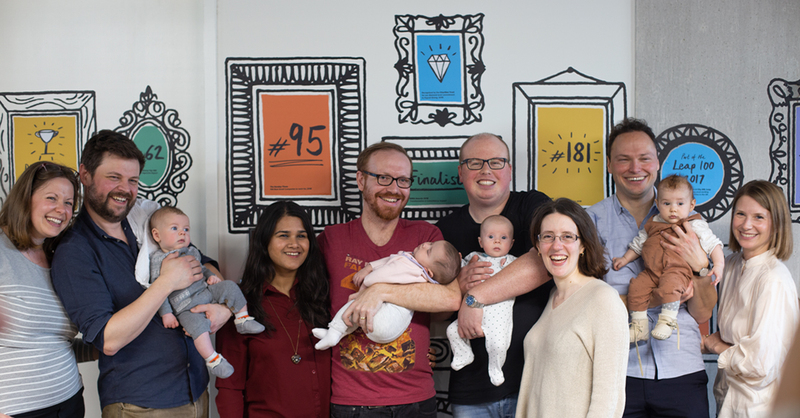 Genderless Parental Leave was a pretty obvious change for us to make; it’s probably the one change I’ve suggested at Red Badger that has had a unanimous ‘yes’ from the leadership team, plus some surprise that we weren’t already offering it. It means that new parents, regardless of gender, can take our enhanced pay at any time within the first year of their baby’s life or within the first year of adoption. This Danish report into the gender pay gap in the UK, the US, Denmark and Sweden shows that the moment a woman has her first child, she takes an immediate hit, with a 30% gender pay gap opening up straight away. This isn’t helped by the statutory pay schemes under UK law, where statutory maternity leave offers 39 weeks of pay and statutory paternity leave is just two weeks of pay, reinforcing the gender stereotypes in the home. SPL was introduced by the government to try to combat this by offering statutory SPL pay and time off to both parents but the limitations to pay and the physical elements of childbearing (both recovery and breastfeeding) mean that the mother is far more likely to take the paid portion of the time off. This coupled with the financial impact of the partner taking leave in the unpaid period as well as the social judgement and expectations are reflected in the low take-up of SPL, with figures suggesting they are as low as 2%. In addition to the gender pay gap, being away from work for a prolonged period of time often results in women losing their confidence and/or being overlooked for promotions and pay rises. At Red Badger, we’re committed to supporting both men and women back to work following any kind of career break. While we’re not saying Genderless Parental Leave is the only answer, in our own small way, we’re trying to break gender stereotypes - both in the boardroom and at home. Genderless Parental Leave is enabling Badgers to take paid leave within the first year of their child’s life/adoption to both bond with their child and to support both parents back to work. Under our Genderless Parental Leave scheme, all employees with six months service or more are encouraged to take either 12 or 16 weeks of paid parental leave at any time within the first year after their baby is born/placed for adoption. In conjunction with this, we are reviewing our approach to flexible working to enable better work-life balance for all badgers (not just parents) and we work on the basis of continuous improvement to shape our employee experience for the better. At the end of 2018, we welcomed four new badger babies and we’re already expecting quite a few more badger babies this year. “After initially taking the first 6 weeks of Maya’s existence off work (a combination of paternity and Christmas leave - good timing), I’ll be taking 10 weeks of Shared Parental Leave from June to August this year. Being at home for those early stages felt hugely significant - not only in terms of getting to know Maya and seeing all of her first “firsts”, but also for giving my wife and I the time to explore the seismic change to our lives that parenthood brings. Nothing can prepare you for those eye-opening first few weeks (or eye-closing, given the tiredness levels), but knowing I didn’t have to juggle them with work commitments meant we could focus on giving Maya the best possible start. Looking ahead to June, I’m excited about taking on the responsibility of lone parenting during the week, so I can fully appreciate the effort and planning that goes into the seemingly most simple trips (I’m fully expecting to get caught out on the first few occasions). My wife and I both felt strongly that we should share the responsibilities, and Shared Parental Leave allows us to do exactly that. We’re always looking for great people to join our team. If you would like to join us, take a look at our jobs page.